Looking for a Church family? Join us this Sunday. We have two services on Sunday and a meal and program on Wednesdays. From fun events to bible study, we make sure our kids are engaged in a living Gospel and in a way that will help them grow closer to Christ everyday. 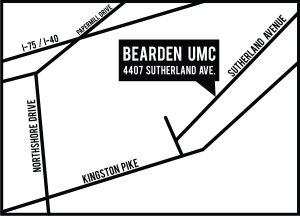 At Bearden, we offer several opportunities for all generations to get involved! Start with Sunday Schools, Leisure Time, United Methodist Women, and other Small Groups. Loving others as Christ loved us.